E (Exact) indicates that the conversion given is exact by definition of the non-Si unit or that it is obtained from other exact conversions. (1) Values are those of Allen . (2) In common usage "Joule" is used for energy and "Newton-metre" for torque. (3) Value is that adopted by the International Astronomical Union in 1976 [Müller and Jappel, 1977]. Reported values of the equatorial radius of (he Earth differ by about 20 m. It is therefore recommended that this unit not be used except in internal calculations, where it is given a single defined value. (4) Values are those adopted in subroutine ROITAP, described in Section 20.3. Vanguard units should be avoided if possible because of differences in the definitions of the units involved. 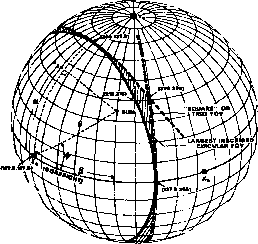 The Vanguard unit of length is equatorial radius of the Earth; the Vanguard unit of time is the time for an Earth satellite to move I radian if the semimajor axis is 1 Vanguard unit. (7) For high-precision work, consult Appendix J on time measurement systems. The conversions for the length of the year are derived from values, given by Newcomb [ 1898], which define the unit of ephemeris time. The most convenient method for determining the time interval between events separated by several days or more is to use the Julian Date. See Section 1.4 and subroutine JD in Section 20.3 for a convenient algorithm for determining the Julian date and Appendix J for a table of Julian Dates. (8) Values are those of Mechtly .